The Tory maverick, who wants MPs to throw out Theresa May’s Brexit deal on Tuesday, issues a blistering attack on the prime minister in today’s Press and Journal. In an exclusive piece, he argues her plans hand the bloc “infinite power to bully and blackmail” the UK to “get whatever it wants in the future negotiations”. And he insists French President Emmanuel Macron will not “let Britain out of jail until we have satisfied his demands for UK fish”. The damaging comments come as the prime minister has signalled MPs could be given the power to decide whether the UK enters the so-called backstop arrangement aimed at preventing a hard border on Ireland until a permanent future relationship replacement is agreed. She indicated parliament could be offered the choice between that or lengthening the transition period, currently due to end at the end of 2020, by “up to one or two years”. The latter could have implications in relation to the common fisheries policy (CFP), as the EU could insist its rules must continue to apply to the UK – unlike in the backstop option – during any further extension. SNP MSP Stewart Stevenson said the industry could end up with “precisely no gains whatsoever from Brexit, trapped in the CFP with no voice or a say in negotiations until 2022”. But Scottish Secretary David Mundell has previously said he “could not support” the UK being bound by it beyond the currently agreed point. And he repeated again yesterday that it remains the government’s “resolute position” there should be no link between access to waters and access to markets, rejecting claims fishermen are being sold out as “old fashioned scaremongering”. In a speech at the Scotland Office in London, he said: “The prime minister has defended our fishing industry in negotiations so far – and has pledged 100 per cent to do so in future. 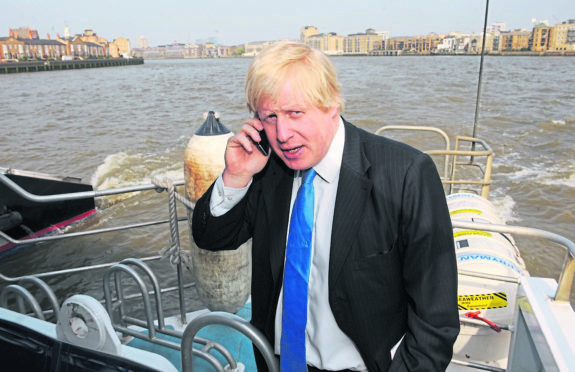 But, hitting back at his remarks, a Scottish Conservative source said Mr Johnson’s words “might carry some weight if Scotland’s fishermen agreed with him, but they don’t”. Conservative MP David Duguid, who represents Banff and Buchan, said Mr Johnson had “got this totally wrong”. He added: “Of course the French want the current arrangements on fishing to continue – EU boats catch more of our fish than we do. “But that doesn’t mean the UK will simply roll over. “We want an agreement on fisheries – just like every other non-EU independent coastal state – but if we fail to reach that agreement by the end of 2020, EU boats will be locked out our waters.